Sian offers a discount of 25% on their first / introductory lesson! I am a respected bassist with experience both in and out of the studio, as well as performing within the thriving music scene in Southampton and elsewhere! After receiving the Peter Evans prize for the highest performance mark in the final year of my degree, I am knowledgeable about a huge range of playing styles and techniques and am a friendly, enthusiastic and adaptable teacher who can provide for everyone. I am also currently the bass teacher at River Studios in Totton, The Guitar Mule in Southampton and have regular students, all wanting to get different things out of their lessons which I love to provide. I feel it’s important for budding musicians to know about a range of subjects from how their equipment works all the way to individual right-hand technique. It’s important to provide individual needs for different players as everyone will have different inspirations and motivators. Keeping people interested, enthusiastic and above all, excited about music is my aim. My passion for music is infectious and I want to provide people with the same nurturing and opportunistic environment, advice and experience I have had the pleasure of receiving. From a young age, I always had a passion for teaching and have taught since I was at school. Ever since graduating University and becoming the bass teacher at River Studios, I have enjoyed teaching and love to provide students with individual and personalized lessons to get the absolute best out of them. I have some regular students of differing ability and age and adapt accordingly. I have also provided one-off sessions for people who just want a foot-up into certain projects, genres or even gig advice. 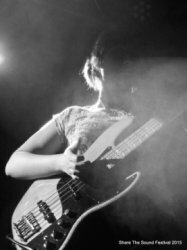 As a performer, I have done a range of gigs with different groups and musicians, as well as recording a range of bass parts in studios. I perform regularly in a couple of bands that gig locally as well as dep work such as function gigs. Recently, we supported a Mercury prize-nominated jazz group known as the Roller Trio and I also work in venues vital to the buzzing Southampton scene. My approach to tuition relies entirely on the students needs and desires. It is vital to have a good understanding of students passions and therefore encourage them towards their own personal goals as well as opening the door to several other interests. It's important the tutor has had experience with a range of people - age, technique, ability, interests etc in order to accurately gauge the best programme for each individual as well as being able to be flexible and adaptable. I am organised and passionate about music and teaching and I would love to pass the music bug on! SianFrom Rich (5/5): Sian is fantastic. A natural teacher with genuine enthusiasm for music. Which is infections, I’m left buzzing after a lesson. Works at your pace and explains everything in depth and in context to song/band situation. Imparts theory in a way that you actually understand it! Which was a revelation after trying to learn it from books. She’s been a fantastic help to my playing and songwriting in general.